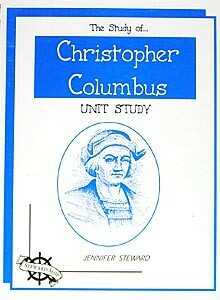 The Study of the Christopher Columbus Unit Study, part of the "Study Of..." series by Jennifer Steward is a series of teacher's guides for K-8th (content can be used for higher grades - just use upper level books and materials), offering study outlines, ideas for assignments and activities compiled by subjects with corresponding reproducibles, resources list, spelling words and more! These guides are designed to give you a plan and are more general in nature. They are not so specific as to detail what you should do each day. Since each family is different (number of children, ages, books you have acces to, etc.,) these guides just give you the tools to put together your own tailor-made study. Contains Christian content. From Stewardship Publishing.